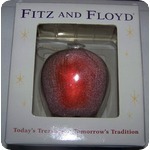 Fitz And Floyd Renaissance Apple Ornament New In Box. They Are Only On The Outside. The Ornament Inside Is In Great Condition. The View When Taken Through Plastic Bubble.